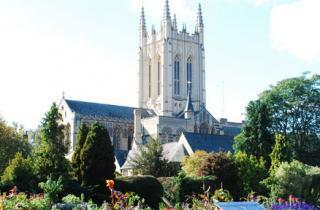 St Edmundsbury Cathedral, Bury St Edmunds, will observe St Edmund’s Day with events and services. From 18 to 20 November local school children will visit the Cathedral for activities linked to the story of St Edmund, concluding with the Edmund Schools’ Festival on the morning of Friday 20 November. Also on Friday 20 November, the Guild of St Edmund, the Cathedral’s team of volunteers, will mark the day with Holy Eucharist at 1 pm, followed by a lunch and talk by local historian, Martyn Taylor. The Cathedral’s bell ringers will ring the bells in the Norman Tower especially to mark the day, firstly before the 1 pm service and then again in the evening from 6.15 pm, ahead of the St Edmund’s Day Dinner taking place in the Athenaeum. The observance of the Feast of St Edmund continues at the Cathedral on Sunday 22 November with Choral Evensong at 3.30 pm, during which new canons of the Cathedral will be installed. The Northgate is redefining the boutique experience. The hotel offers an informal, relaxed space to eat, drink and stay.